HM King Hamad joins HRH Premier and HRH Crown Prince at the opening ceremony. He announced that the new housing project would be named “Salman Town”, in tribute to HRH the Crown Prince for his dedicated efforts and outstanding contribution to the nation’s progress and prosperity, reported BNA. The new housing town will boast all major amenities including health, educational, religious and sport and transportation facilities in addition to modern road network and developed infrastructure for more than 90,000 residents. UAE-based Abu Dhabi Fund for Development (ADFD) has allocated Dh2.6 billion ($700 million) towards the project. It has been developed as part of the Dh9.175 billion ($2.5 billion) UAE grant for Bahrain being managed by ADFD within the GCC development programme for Bahrain. HM the King was greeted by school students on his arrival at the site of the ceremony. He was also welcomed by Housing Minister Basim bin Yacoub Al Hamer and Northern Governor Ali Abdulhussein Al Asfoor. “By good fortune, the opening of this modern milestone comes as part of a massive urban and civilisational stride that meets the needs of all region and consolidates the standing of each governorate to play its role in supporting the national economy for Bahrain to be a model of modernism and development.” he remarked. He lauded the Bahraini nationals for their crucial contribution to the landmark march of development, hailing citizens’ enlightened thinking and firm belief in their ability to brave all challenges and seize all opportunities for positive change – all for the sake of he nation’s progress and prosperity. 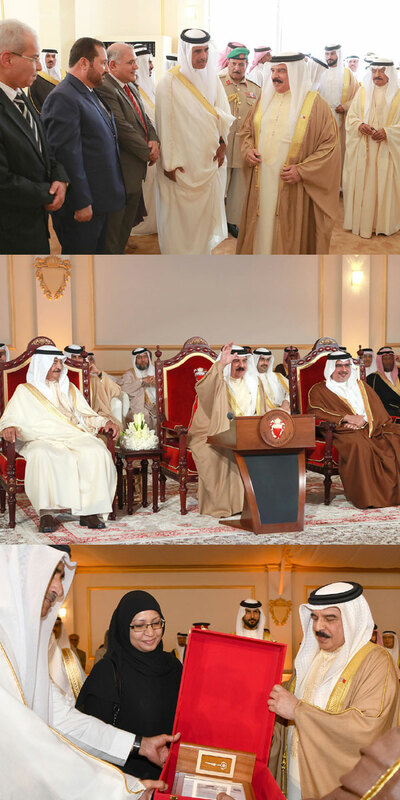 “These lofty qualities, which long marked the people of Bahrain since olden times, is now leading them towards more security and stability”, said HM the King, commending all enterprises for supporting the completion of the project – adding that the Northern Town would rank among the cities of the future. At the end of the ceremony, HM the King handed over the first two units to eligible recipients. In his address, Al Hamer paid tribute to HM the King for patronising the inauguration of the landmark development. The housing minister hailed the string of remarkable achievements and outstanding strides in the prosperous era. He underlined various stages in constructing the model town, ever since HRH the Crown Prince laid the foundation stone, including reclamation, engineering blueprints in cooperation with the French Urban Authority, reported BNA. He commended the support of the government, chaired by HRH the Premier, as well as HRH the Crown Prince through the Executive Committee. He also commended the ministerial committee for urbanization and infrastructure, chaired by Deputy Prime Minister Shaikh Khalid bin Abdulla Al-Khalifa, said the report. ADFD Director General Mohammed Saif Al Suwaidi said: "We have actively supported Bahrain government over the past years in achieving its sustainable development objectives. These ADFD funded projects have translated into profound benefits for Bahraini society and accelerated the country’s economic growth." ADFD, he stated, is committed to stepping up collaboration with the Bahraini government and moving ahead with the implementation of several vital development projects in the country that serve key sectors including housing, water, health, transport and communications. Spanning an area of nearly 740 hectares, the city was built after filling about 37.5 million cu m of land in the shallow part of the Bahrain Island with a depth ranging from half a metre to two and a half metres over the past two years. In addition to housing, the project involves the construction of roads and two dedicated pedestrian and vehicular bridges, as well as the provision of sewage services. Later a documentary film which showcases the construction of the multi-phased Northern Town was shown, highlighting cooperation between all parties and different amenities and facilities – including beaches, mosques, schools, universities, and nurseries, in addition to hospital, health centres and clinics and sport city which includes a football stadium, it added.